Thank you for joining our volunteer community! I don't have one, but will create one! Gmail is the most popular email provider, and we'll help you create an account! I already have a Google account. If you already use Gmail or Google services like YouTube, etc., you are ready to go and can sign up below! I don't have one, and want to use my current email. If you have email through another provider like Outlook, Yahoo, Hotmail, etc. 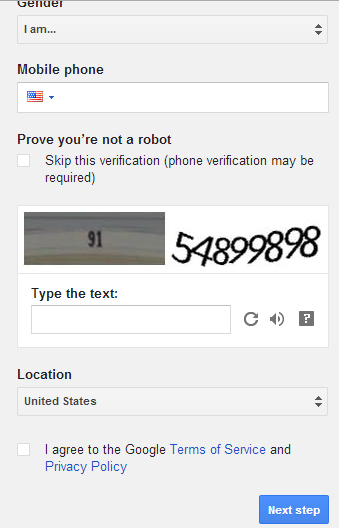 you can tie it to a Google account. Then type in the password twice. Enter the password in a password manager program if you have one, or write it down. Enter a recovery email address if you like. This is optional but a good idea. Choose your gender or choose Rather not say. Click Next, scroll to the bottom of the Privacy and Terms and click I agree. If asked, follow instructions for the verification image. Type in the numbers or letters that you see on your screen (the picture below is just a sample). Choose your Location from the list. You can contact us at voltraining@learningally.org or vol-support@learningally.org but remember that you can also get help directly from Google. Try this page for more information about accounts and setup. If you forgot the password for your Google account, please visit Google password recovery. Then type in a password twice. You can use the same password that you use for that email account to make it easy. Enter the password in a password manager program if you have one, or write it down. Click the Verify Now button or click the link to Request a verification email. Go to your email account for the follow-up message. Follow those instructions and click the link to notify Google that you received the message and your account is properly set up.